Over the years, I have found some beautiful pictures and prints while thrifting. Catherine has quite a collection as well. Below is one of my favorite little finds. I found this pic of two little girls. (I presume sisters). Reminded me of my childhood, and my own big sister showing me "the way". The vintage colors are just gorgeous. Am always on the lookout for little landscape prints like this one of the Golden Gate Bridge. I like to prop them up against the wall or place them on a little shelf. As we reside in the Bay area, this one has special meaning. A Hallway Decorated with Thrift Finds! We have a long hall way leading to our bedrooms. For the longest time I had done nothing to the long hallway wall. It was so boring! On a Saturday (half-off day) at one of my favorite thrift stores, I found 4 matching book-cases that were an ugly bright yellow. I bought all 4 shelves for $2.50 @ piece, brought them home and painted them a cream color. Above the shelves, I hung a variety of white and cream framed mirrors (all of which I purchased at thrift stores over the years). Now, when I walk down my hallway, it feels so serene! Always keep a watch out for shelves, book-cases and or furniture pieces that could easily be restored. 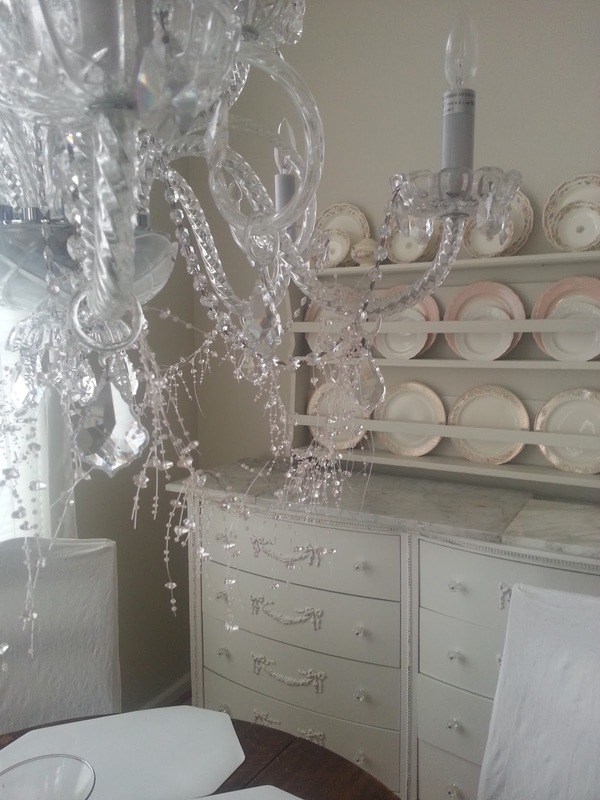 To give a plain chandelier a little zip, try dressing up the bottom crystals with beads and/or recycled earrings. Here is a pic of my living room chandelier. I wanted to add a touch of turquoise to give the fixture a little color. While I kept an eye out for some added bling at thrift stores, I was not having any luck finding what I wanted. Happened to run to Walmart, and in the front of the store was a discount table with several pairs of dangly turquoise earrings marked $1.00 @ piece. Bought all 4 pair. The earrings along with 6 turquoise and crystal bead ornaments found at the dollar store have added just the right amount of blue to my chandelier. All for a grand total of $10.00. Here is a pic of my dining room chandelier. Added some taupe crystals on the bottom for extra sparkle. Found these 6 taupe crystals at a thrift store in Oregon. Some thrift-days you just get lucky! I was so excited to come back with such amazing finds this last week. I am a huge Marilyn Monroe fan, and this print of her is just gorgeous. Also I found a Marilyn t-shirt! What a "Marilyn" kind of day. Along with my Marilyn memorabilia, I picked up a few necklaces, a vintage purse (I love the long strap), some books, and 4 other shirts which will be perfect for back to law-school. Whenever I go thrifting, I am always on the look-out for beautiful paper cards, notes, post-cards etc. Here is beautiful bookmark I found buried in a basket. It is my favorite book-mark in the world. Sometimes when you dig, you can unearth buried treasure. Happy Sunday everyone! This week-end, I found this crystal flower metal bookmark. Love this too. The Power of the Slipcover! Never underestimate the power and functionality of slipcovers. I was lucky enough to find Rachel Ashwell's British Rose slipcovers for both my family room and our vacation house. I found one sofa slip in the bottom of a box at a flea-market, and found the loveseat slip on-line. Was so happy to find it on-line, I drove all the way to Sacramento on a Super-bowl Sunday to pick it up. Slipcovers are so functional. They are so easy to pop in the wash. I never iron them, as I like the rumpled shabby look. Here is a pic of my sofa slip. Love, Love Love the British Rose design! Vintage and/or costume jewelry is fun to look for at thrift stores. Here is a sampling of some of my finds. Also, if the price is right, never pass up a vintage jewelry box. With all the compartments, it is perfect for storage and display. My plate rack is filled with vintage china found at thrift stores, flea markets and yard sales. I don't worry about matching all the pieces. I like to mix it up. I usually do not pay over $2.00 per piece. It is fun to collect and display. If there are any musicians out there, check your local thrift stores for sheet music. This was a picture taken a few years back when I was renting my violin. You can find classic artists (Mozart), period pieces (J.C Bartlett), or instrumental exercises/techniques. I absolutely love J.C. Bartlett's "A Dream" sheet music seen here on display in my old room. ...And even if you are not a musician, the illustrations on old sheet music can be framed and hung up, used for a craft project, etc. Hello everyone! Julie here. Hope you are having a wonderful day. Thought I would post a pic of a great lamp-shade I recently found at a local flea market. The vender made this shade by wrapping different lace trims around the perimeter of the shade. Such a cute idea! I love it here in my family room. It would be easy to make a shade like this of your own using trim(s) of your choice. Hello everyone! My name is Catherine. I grew up reluctantly tagging along with mom (Julie) as she ventured through thrift stores and flea markets. I quickly learned that Mom, who appreciates a good bargain, also has a discriminating eye for both fashion and home design. Mom furnished our home beautifully, and almost exclusively with thrift and flea market finds. While mom’s decorating style has been inspired by designers Rachel Ashwell and Atlanta Bartlett, you will see as you peruse our blog how she has developed her own inimitable style. As for fashion, I am always astounded at her finds, most-often vintage or vintage inspired. While it took some time before I fully embraced thrifting and the thrill of a week-end spent flea-marketing, I now relish in the past-time. My style deviates slightly from that of mom’s. While we both love vintage, I also have an affinity toward bohemian style. I am obsessed with old jewelry pieces and have amassed a beautiful collection of vintage jewelry, many pieces of which I will photograph and post for you. I also enjoy collecting both gently used and antique books, and have acquired several first editions. I hope to one day incorporate my book collection into my home décor, as I truly believe books make a home! Thrifting has been a wonderful diversion from our professional lives. Mom is a part-time attorney and I am a 2nd year law student. While we cannot always enjoy the “thrill of the hunt” together, as we live on opposite coasts, we enjoy sharing our “finds” via text, facebook and e-mail. Our experiences have been so much fun that we've decided to share our found treasures with you. We hope that our blog gives you both home decorating and fashion inspiration. You will find recurrent posts, sometimes by me and sometimes by mom. The first few years, posts will likely predominately be those of Mom’s while I finish law school. We hope that you too will become “Hooked on Thrifting.” It is a wonderful way to have fun, as well as save money in these economically challenged times. As an added bonus it is eco savvy. As a passionate environmentalist, any activity that helps each one of us reduce our own carbon footprint is one worth pursuing. Happy Thrifting! Here is hoping that you score some beautiful treasures at that next thrift shop and/or flea-market. Here is a picture mom took of her living room. Notice the mirrors above the sofa. Mom bought ALL of these mirrors at either thrift stores or flea markets!